IT LOOKS like a construction trailer sitting outside an underground car park at the rear entrance of the Institute for Experimental Physics of the Free University of Berlin. But late at night the door to the car park opens and a laser beam shoots out of the side of the trailer, scorching the cement wall at the far end, 100 metres away. The researchers at Ludger Wöste's laboratory who control this device are not, despite appearances, rehearsing for the next James Bond movie. Rather, Teramobile, as their laser is called, is designed to probe the nature of lightning. Dr Wöste and his team hope to be able to make lightning artificially, using what they say is the world's first mobile femtosecond laser (so-called because the pulses of light it emits last only a millionth of a billionth of a second, an eyeblink known to physicists as a femtosecond). 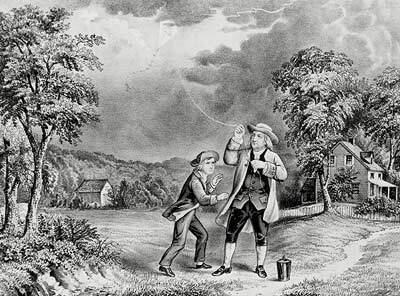 Remarkably, more than 200 years after Benjamin Franklin showed that lightning is a form of electricity by flying a kite in a storm, the phenomenon is still not properly understood. But no one doubts its importance. Lightning has a significant role in controlling the chemistry of the atmosphere. And knowing more about it might let meteorologists issue better storm warnings. Much of the ignorance about lightning is because the natural stuff is unpredictable and complicated. Currently, researchers must either literally wait around for lightning to strike, or else they can try to trigger it with rockets that work by trailing copper wires from the sky, thus “earthing” the clouds they are fired into. Using a laser would be easier. When a laser beam cuts through the air, the intense electric and magnetic fields of which its light is composed tear the atoms and molecules of air apart, creating what is called an “ionisation channel”. Because this channel is an electrical conductor, it provides a place for surrounding electrons to go. If there are enough free electrons around (and a thundercloud is full of them) lightning will be formed. At least, that is the theory. So far, Dr Wöste and his colleagues have succeeded only in generating lightning in the laboratory—or, at least, in the car park. However, they are confident that the principle will work outdoors as well. So much for unpredictability. That lightning is complicated as well, is because the electric and magnetic fields involved in it interact in poorly understood ways, high up in the atmosphere and on timescales too short to be observed with existing outdoor instruments. Originally, lightning was thought to consist simply of giant sparks. A spark happens when an electric field pulls the electrons and atomic nuclei of a gas (which have opposite electrical charges) in opposite directions. When the field is strong enough to overcome the attraction between electrons and their nuclei, there is a sudden electrical discharge. The problem is that, despite years of effort, researchers have never observed an electric field in a thunderstorm that is powerful enough to do this. In fact, the observed fields have been about a tenth of those required by simple spark theory. On top of this, spark theory suggests that lightning should generate X-rays. Unfortunately, no one can find them. An observation made earlier this year by Joseph Dwyer of the Florida Institute of Technology and his colleagues, may, however, have solved the mystery. Dr Dwyer succeeded in observing X-rays that were generated by lightning in a thunderstorm in Florida. But they were not the sort of X-rays that standard spark theory predicts. Instead, they support what was once a maverick theory of lightning, pioneered by Alexander Gurevich of the Lebedev Institute in Moscow in the early 1990s. According to Dr Gurevich's theory, known as “runaway breakdown”, lightning is actually triggered by cosmic rays—energetic, electrically charged particles that come from the depths of space. A runaway breakdown happens when a cosmic ray accelerates one, or a handful, of electrons to very high energies, and these electrons in turn cause a chain reaction in the air by knocking more and more electrons away from their parent nuclei. An initial electric field has to be present for the chain reaction to occur but, conveniently, this field needs to be only a tenth of that required by conventional theories, and is thus precisely in line with observations. So it looks as though lightning, even though it is no longer thought of as a manifestation of the wrath of the gods, does indeed have an extraterrestrial origin. The growing interest in lightning stems not only from curiosity about the phenomenon itself, but also from the notion that it may affect both the weather and the long-term climate more than had been realised. To this end, Hugh Christian and his group at the Marshall Spaceflight Centre in Huntsville, Alabama, a laboratory run by America's National Aeronautics and Space Administration, are studying how lightning appears in the storms that cause tornadoes. Lightning is not the cause of tornado formation, but it does allow Dr Christian to peek into the heart of a storm. Although radar can track the way winds flow within a storm, it cannot easily discern the total energy of a storm, and whether that energy is increasing or decreasing. This is important, because an increase in energy means that a storm is more likely to form a tornado. However, Dr Christian and his team see a sudden jump in the number of lightning flashes within a storm about 20 minutes before tornadoes hit the ground. When it comes to tornadoes, even this brief warning is valuable. And according to Dr Christian, his lightning-based technique also gives a much lower number of false positives than radar observations, which means it is less likely to cry “wolf” by mistake. Nor are tornadoes the only thing that lightning can predict. Another group of researchers, based at Paul Sabatier University in Toulouse, France, is using lightning data to try to forecast the occurrence of hailstorms. And the importance of lightning is not confined to predicting the behaviour of storms. It also affects the composition of the air. Earlier this year, Renyi Zhang of Texas A&M University and his colleagues published a paper in the Proceedings of the National Academy of Sciences arguing that lightning is the most important source of ozone in the upper atmosphere. Because this ozone absorbs ultraviolet radiation from the Sun, and thus makes the Earth a healthier place for living creatures, understanding where it comes from is important. Furthermore, Dr Zhang said in his paper that lightning is also responsible for most of the nitrogen oxides present in the upper atmosphere. These are greenhouse gases (ie, they help to retain heat in the atmosphere), and thus have an important role in regulating the climate. In the same vein, Colin Price and Mustafa Asfur, of Tel Aviv University, recently presented a paper to a conference of lightning scientists held in Versailles, near Paris. They observed that lightning activity is closely correlated with the presence of water vapour in the part of the atmosphere known as the upper troposphere. Water vapour is the most important greenhouse gas in the atmosphere, and the upper troposphere marks the boundary of the part of the atmosphere where most weather is generated, so this may be an important finding—though whether the water vapour is actually causing the lightning is not clear. This is all a long way from old Ben Franklin, that arch-rationalist, and his kite. But it seems that lightning, the epitome of frightening and untameable natural phenomena, still has a few secrets hidden from rational modern man.